As you certainly already know, the CFL once expanded to the United States. The teams, jersey’s and stories behind the expansion are not only amazing, but at this point have entered cult status with CFL fans. The logos are a thing of beauty (I’m partial to the Shreveport Pirates myself) and the uniforms were something else. We even got people pretty excited when we announced a CFL team would wear Las Vegas Posse throwback unis this season (spoiler alert, this was an April Fool’s joke). JUST IN: #CFL announces Las Vegas Posse throwback jersey night for 2017. Well, lost in all the shuffle of the American expansion is a team that never quite came to be. The Miami Manatees. Yes, that was going to be a team and yes they were scheduled to play in the 1996 season. However, the American expansion ended in the spring of 1996 so the Manatees never got to take their first snap. One thing we do have though is what the team’s logo was going to be and well, it’s a thing of ummm… beauty? Yes, let’s go with that…. Well, we recently came across a post from HeroSports.com who have well, an opinion on the Miami Manatees logo + jersey + helmet look and they’ve found a mock up of what the whole kit would look like. While they might think it’s the worst ever, I happen to like it. 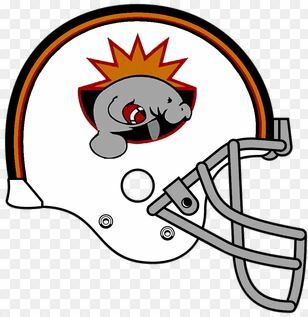 The Orange & Black is nice and if you don’t like a logo of a manatee holding a football you have no imagination! Here is the mock-up courtesy of SportsLogos.net Forums.